Located in Weybridge, Surrey, Sir Hugh Fortescue Locke-King built Brooklands to be the world’s first purpose built motor racing circuit and later, the first airfield. The first competitive races and speed record attempts were held in 1907 and Brooklands shaped motor sport. When war broke out in 1939, the entire Brooklands site was given to the Vickers-Armstrong and Hawker aircraft companies to develop and build military aircraft. One fifth of the RAF’s Wellington Bombers and Hurricane fighters were produced at Brooklands. Sir Barnes Wallace, engineer and inventor of the bouncing bomb, also worked here. As a prime strategic target, there was an urgent need to protect the 5000 staff employed in building military aircraft. A vast air raid shelter was excavated and cast. A series of 17 tunnels, one mile in length, 2 metres high by 1 metre wide, lined in concrete, complete with gas-tight doors, air filtration equipment and water supply. At the end of the war, still in their original condition, the shelters were secured, and lay dormant for over sixty years until August 2009. With the installation of humidity controls, the subterranean vaults were converted into Locke-King Vaults - the perfect environment for long term storage of fine wines. 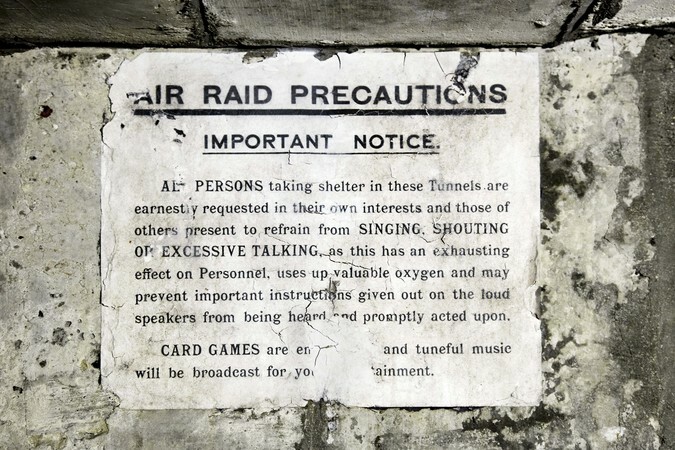 The redevelopment team have been careful to retain as many original features from the tunnels as possible including original posters, signs and wall drawings, preserved in the cool, dark, constant atmosphere.